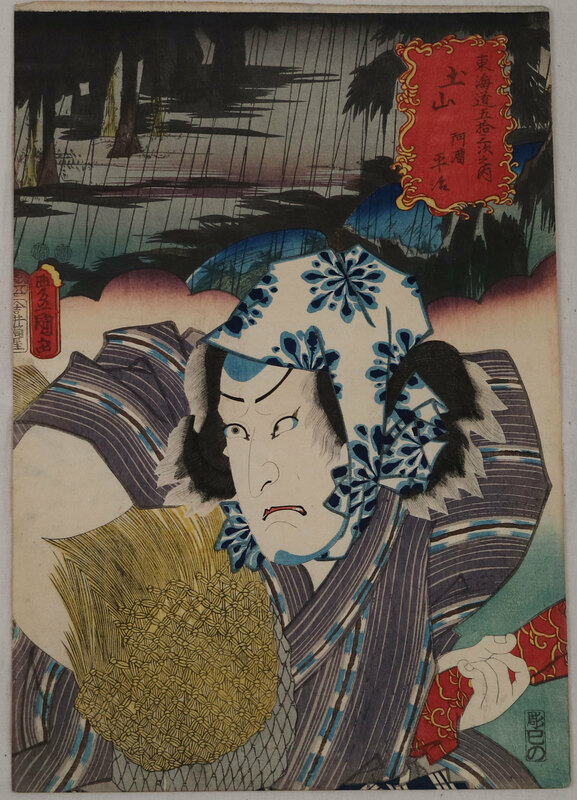 The landscape of Tsuchiyama in rain is illustrated at the back ground of Ichikawa Kodanji IV as Akogi Heiji. Akogi Heiji did fishing for his sick mother at the Akogi-ga-ura Bay where the Ise Shrine prohibited killing any kind of living creatures since they used this bay to catch the offerings for god. Since Heiji broke this rule, this legendary figure was punished. He was tied his body with a rope and thrown into the ocean. ©Copyright Fujisawa Ukiyo-e Museum. All rights reserved.